With a global financial crisis, austerity measures, and bankrupt cities and countries defining this historical moment, the question of utopia seems especially urgent. In the humanities, this question has manifested itself as a renewed interest in political art’s ability to foster human emancipation. More specifically: is political art still possible? Christopher Pavsek’s new book, The Utopia of Film, takes up this concern, exploring the utopian aspirations of Jean-Luc Godard, Kidlat Tahimik and Alexander Kluge, the three filmmakers at the center of this study. 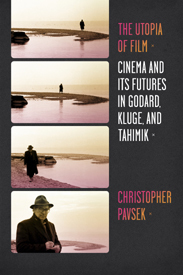 But Pavsek’s book, as its title suggests, goes further than advocating for the political effectiveness of three filmmakers, and makes a strong case for cinema as the medium with a special relationship to utopia, a unique ability to articulate it and perhaps even to bring it about. Devoting a chapter to each filmmaker, Pavsek offers particularly thoughtful and incisive readings of Godard’s Film Socialism (2010), Tahimik’s I am Furious Yellow (1981-1991), and Kluge’s The Assault of the Present on the Rest of Time (1985) (among several others), in conjunction with Alain Badiou, Theodore Adorno, and Fredric Jameson, who form Pavsek’s theoretical corpus. Godard’s conception of utopia – stated explicitly in Film Socialism – is a classical one indeed: the dissolution of private property (this is of course one of the key features of Thomas Moore’s remote island society), but also the disappearance of the individual subject, inextricably bound-up as the latter is with notions of property. Pavsek argues that montage renders these ideas visible for Godard in a number of ways. For one, the sequencing and collage of quotes, paraphrases, reproduced images in Godard’s essay films -nearly all appearing without attribution – suggest a kind of knowledge production that is deeply collective. These objects circulate and connect to others, making themselves available for new insights. Thus, the notion that any knowledge is produced by an individual subject, as though in a vacuum, is suppressed. Pavsek suggests further that these recombinations via montage are object lessons in becoming other; they illustrate the loss of one’s own and then the taking on of a new subjectivity. Each individual image ‘loses itself’ in juxtaposition with another. The montage and layering in Godard is often so complex that one cannot make out individual images (63). But Pavsek’s main concern – with both Godard and Kluge – is the question of whether or not film thinks, which is also to say, can film philosophize? Can it produce concepts? Pavsek enumerates the obstacles to this idea, the most important being Adorno’s Bilderverbot, which asserts a sharp separation between concepts and images, insofar as the latter have a tendency to “freeze over into positive, reified verities that undermine thought, which must always sustain its commitment to a negative dialectic…” (16). Once again, it is montage that overcomes this particular obstacle, refusing the reification of the image via constant juxtapositions. However, Pavsek also mentions the ubiquity of text in Godard, in the form of both images of books and a loquaciousness on the part of his characters and narrators. If film is to think, that is, think with images, it must not rely too heavily on language. Pavsek’s examples of Godard and, in the introduction, of Marker, are examples of essay films, films where too often language in the form of voice-over tells us how to read the image, dominating the image track. Film, then, must be shown to think across all modes. Narrative and experimental films alike must think, as well as Hollywood blockbusters. That persistent problem plaguing Utopian projects, namely the immediate and nagging suspicion of any project generated by this fallen society, is offered something of a solution in Tahimik’s practice of building from society’s detritus. This not only allows for the possibility of viable positive projects, but has the added value of rooting utopian production in history, the material of both the present and the past, in a way that does not succumb to conservative notions of progress or development (137). The kinds of constructions Tahimik produces in his films – the miniature turbine produced from a small palm tree used to demonstrate hydroelectric energy to his son in Turumba (1983), for example – are perfect examples of what Jameson calls “model railroads of the mind,” of “replicating the great things in handicraft dimensions that you can put together by yourself and test, as with home chemical sets, or change and rebuild in a never-ending variation fed by new ideas and information…these utopian constructions convey the spirit of non-alienated labour and of production…” According to Pavsek, Tahimik uses such moments in his films to display for the spectator a utopian outlook on learning and the pleasures associated with it (123). Furthermore, Tahimik illustrates the utopian prospects of failure itself. As Pavsek explains, the failure of past projects, their inability to become fully realized, “makes the past available for a ‘progressive’ reappropriation in the present.” This idea not only marks Tahimik’s scenes of building from the waste excreted by the present, but also those many idyllic representations of past communities. In the latter case, what might otherwise be seen as conservative – the suggestion that we must remake the past – is rendered utopian insofar as it retrojects “onto the past a symbolic resolution of conflict or antagonism in the present, a resolution that in reality can only happen in the future” (130). The potential productivity of failed projects of the past is taken up once more in Pavsek’s discussion of Kluge, the filmmaker given the most attention in this study. With Kluge, utopia and dystopia operate under separate temporalities, each exemplified by different technologies. Television and New Media foster a perpetual present and a kind of provisional living that goes along with it. Cinema, however, represents the existence of another time entirely. If Tahimik’s representations of older, idyllic communities presents the possibility of another temporality beyond the present, Kluge goes further, claiming that the technology itself, the persistence of the old, is the key to cinema’s connection to utopia. So here, out-datedness, or something marked by the past is turned into a virtue; it presents a rear-guard productivity. Again, in a world of perpetual present, looking to the past can no longer be seen as simply conservative so long as the utopia looks to the past not as a model for the future, but simply as evidence that another temporality exists. If there is a past, there can be a future. That cinema can be “remediated” – to use Bolter and Grusin’s term – by the computer, along with myriad other older media (the gramophone, the typewriter, the telephone), raises the anxiety of The Utopia of Film towards New Media. The computer creates out of these older media a fundamentally different object, one that is functionally equivalent to older incarnations, at least in terms of the content it reproduces (listening to a song on vinyl record or as an mp3 can satisfy the same desire for hearing this or that song). At the same time, indeed, because of this, the computer is a perfect example of The Assault of the Present on the Rest of Time (Der Angriff der Gegenwart auf die ubrige Zeit, Kluge 1985). So much old media brought into uniformity and subsumed under one modern machine represents a flattening out of time, a perpetual present. This goes unnoticed insofar as the desire to see an older film – one shot on film – is satisfied by a digital copy. The Utopia of Film then is very much an argument not so much for cinema generally, but for celluloid in particular; the persistence of this out-dated medium insists on the possibility of a future, a rupturing of the present. This would further suggest a dual effect of celluloid’s disappearance: as digital cinema becomes more and more ubiquitous, replacing celluloid, that possibility of a future represented by the latter medium alarmingly recedes. And, at the same time, the disappearance of celluloid can only mean that its critique of the present comes into sharper and sharper focus, allowing us, once again, to imagine a future. But should we write off New Media entirely? If the computer obliterates the form of all those older media, there remains utopian potential in the content it preserves. That is, those gesture and speech patterns from older films, that record of the past still registers in digital form. Moreover, the aforementioned negative dialectic Kluge sees performed through montage still functions. The decay of celluloid means investing renewed faith in cinematic montage. The Utopia of Film unfortunately does not venture too far towards this possibility of New Media, preferring instead to focus on the past and classical auteur filmmakers. But this would mean a new project altogether and Pavsek’s book at least calls it to mind. When Kluge celebrates the incompleteness of early cinema – its inability to sustain a narrative on its own meant that the audience contributed to the film via sing-alongs or prior knowledge of a contemporary play to which the film referred. Is this same openness not suggested in user-generated Youtube responses to pop culture, or broadened access to filmmaking via digital technologies? In this sense, the dystopian nature of New Media may be overstated here. Further, the insistence on not only filmmaking, but thinking itself as a collective act is somewhat belied by Pavsek’s choice to focus his work on three classic auteurs and to structure his book devoting one chapter to each of them. This is a problem of which Pavsek is fully aware and addresses in his introduction (18). Nevertheless it is a problem that persists, one we are reminded of here and there, for example when Pavsek discusses the “corporeal joyousness” of watching a Kluge film. It is this joyousness “we receive not as mass-produced industrial products but as handcrafted treasures that bear the trace of their makers’ touch” (197). The plural “makers” here refers to “Kluge and his team”. It is moments like these, where Pavsek strains to insist on the collective nature of filmmaking, that we cannot help but remember that auteur cinema is labeled under one name (with the anonymous tinkerers of the group simply known as Kluge’s “team”). We remember also that this suggestion of the unique and coherent work of art stemming from a unique and coherent mind is very much a necessity of commodification. And suddenly that distinction between the mass-produced (i.e Hollywood) film and this handmade, artisanal product begins to erode. The same problem arises with Tahimik’s recycling. It of course relies on work and objects created by others, but the importance of these objects only appears after the auteur Tahimik has worked them over. In spite of these relatively minor drawbacks, The Utopia of Film makes a powerful contribution to the ever-growing field of utopian studies. Pavsek’s insights into Adorno and Jameson and the strong case his work makes for a necessary relationship between cinema and emancipation makes The Utopia of Film a useful text indeed for those interested in film studies and critical theory. Most importantly, Pavsek renews our faith in the utopian possibilities of truly political art. Frederic Jameson, ‘Politics of Utopia’, New Left Review, 25, January-February 2004, 3. Jay David Bolter and Richard Grusin, Remediation, Cambridge: MIT Press, 1999.